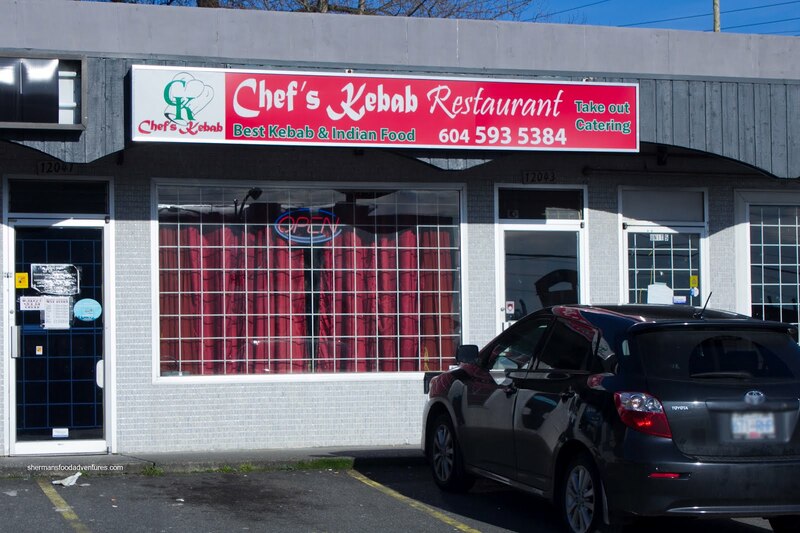 A long time ago, I had visited a Filipino restaurant in Surrey where a peculiar "incident" occurred. As I was snapping photos of my food, an "RCMP" officer who was short and tubby approached me and flashed his badge. He questioned why I was taking pictures of my food. Uh... because I want to??? When did it become an indictable offense to do so? Is it illegal to ogle my Tocilog? Wait, that does sound a bit disturbing... Well, it turns out that this "officer" wanted to treat me to lunch after he found out I was doing it for my blog. Right... I hear it is an offense to impersonate an officer too. Well, that restaurant is long gone and was replaced by another joint that has now become Chef's Kebab. As I was running really low on time for lunch, I decided to drop by for some takeout. They tried to convince me to eat-in, but I assured them, that I really was in a rush. Too bad really since fresh food is always the best choice (duh). Maybe, I had fears the "officer" might return? 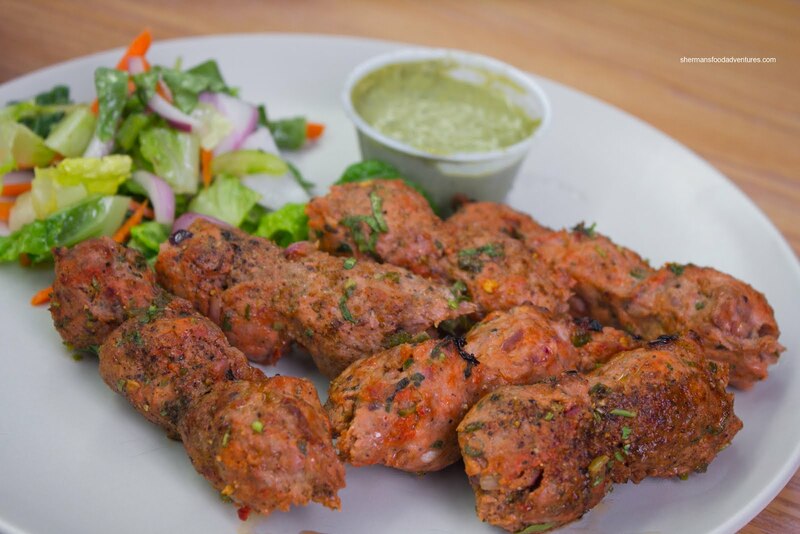 I ended up getting the Lamb Kebabs for obvious reasons (see name of restaurant). These were a mixture of ground lamb, onions and spices. These were not very gamy, for those who care about that. I think the bevy of spices masked the gaminess. I would say these were pretty good since they were quite moist. This was a large amount of meat for an order of kebabs. For my main, I went for the Goat Curry and it was fantastic. The portion size was so large, it could've easily passed for 2 orders. 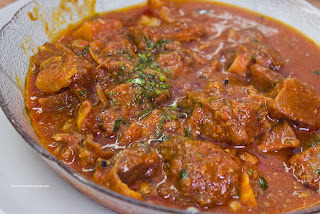 There was lots of tender goat which had the desired meaty-gelatinous quality to it. The curry was mild, yet not lacking in flavour. I really should've chosen rice for this since there was so much sauce. Instead, I went for the Naan and it was of the chewier variety. To be fair, it sat in tin foil for about 8 minutes before I ate it, so it probably lost some of its crispiness on the outside. On the topic of fair, I decided to go for an eat-in meal several months later. This time around, I went for the classic Butter Chicken with 2 orders of naan. 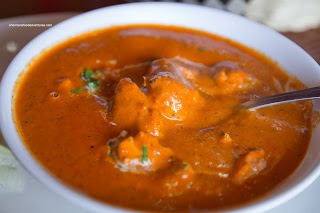 As evidenced by the colour, the sauce leaned towards the tomato paste part of the butter chicken spectrum. I didn't mind it as the sauce had a nice consistency and was not devoid of flavour. The spice level was quite mild, yet I could definitely taste the spices. I appreciated that they used tandoor-cooked chicken on a skewer. The texture and flavour of the chicken was quite nice. 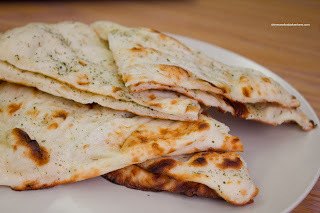 As for the naan, it was nicely chewy with a touch of crispness on the outside (which I expected compared to the takeout). However, I found the naan in general to be pretty thin and flat. Based on my 2 visits here, I would say the food is pretty decent and while the prices are pretty standard, the portion size makes it a good value. Hey, nice review. Kebab and goat curry image looks great too. Did you use bounce flash to get the soft shadows? Nicely done Sherman! @Ian Nope, didn't use a flash for this one!